In the Basilica of San Clemente (St. Clement) in Rome, there is a beautiful mosaic in the apse. Christ is depicted on the cross, at the moment of His death, having just entrusted His spirit to the Father. But the cross, as shown in the mosaic, is really a tree from which flows out four streams of water and a whole network of branches or vines that fill the rest of the mosaic. The cross-tree is therefore fertile, life-giving, and the vines extend throughout the entire mosaic, symbolizing that the world itself has become a great vineyard in which the fullness of life is present. Whoever created this mosaic probably had in mind the verse from St. John’s Gospel: “I am the vine, you are the branches” (Jn 15:5). Represented artistically, however, is a great truth: In the cross, as vine, we discover the source of our life and fellowship with God. 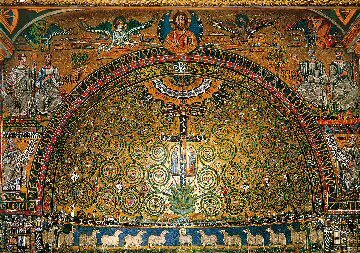 What this mosaic presents to us is an invitation to let our lives be drawn into the vine of God, to give them over to the holy tree that grows from the cross and so become a living branch of it. These ideas are very much at the heart of the solemnity we celebrate this weekend, the solemnity of Corpus Christi – the body and blood of Christ. The gift of the Eucharist, given by the Lord to His church on the night of the Last Supper, is, as the Second Vatican Council tells us, the source and summit of the life of the church herself and of the life of each individual believer. Receiving Holy Communion worthily, that is, in the state of grace, fills us with Christ’s own divine life and unites us to Him in an intimate bond of life and love. The celebration of Corpus Christi, therefore, invites us to reflect upon the fact that receiving the body and blood of the Lord in Holy Communion is more than just a personal gesture; it is a public proclamation that we are in communion with Christ and the church, His mystical body. Corpus Christi reminds us of the need to renew our commitment to Jesus each day, to grow in our fidelity to the church and all that she teaches us, and to strive for unity with our brothers and sisters in the faith. The celebration of Corpus Christi calls us to examine the consistency of our lives with the Gospel and to give ourselves in imitation of that self-giving love that Jesus showed on the cross and that is made present again in the sacrament of the Eucharist. In the Eucharist, we encounter the saving love of the Lord that has transformed and given life to the world. In a real sense, this is the meaning of the apsidal mosaic of San Clemente: The whole world should become Eucharistic, should draw life from the vine that is Christ, crucified and risen. In order for this to happen, though, we have to carry the Lord out into the streets of our cities and towns, into our homes and into our everyday lives. Wherever we go, He should go; wherever we live, He should live. The solemnity of Corpus Christi means that we do not simply eat the Lord’s body and blood the way we might eat a piece of bread. We can only receive Him by welcoming Him with our whole self, opening our hearts and minds to Christ Jesus and then seeking to live continually in union with Him in all that we think, say and do. In that way, we fulfill the command of the Lord to be His witnesses in the midst of our world. There is something else, though. At the very top of the mosaic in San Clemente, the hand of God the Father is portrayed reaching down. The Father’s hand appears to lower the cross from eternity into the world in order to bring the world healing and reconciliation. But at the same time, the Father’s hand also appears to draw the cross-tree upward unto the freedom of the promises of God, into the mystery of the new and eternal life of heaven. Thus, human history and human life have received a new direction and a new destiny: They go with Christ to the hands of God. The solemnity of Corpus Christi is intended to remind us of this upward movement as well. Every time we celebrate the Eucharist and receive Holy Communion, we gain a foretaste of the life to come, an anticipation of the heavenly banquet. This is why the end of this week’s Gospel passage reports that 12 baskets of bread were left over after the crowd of 5,000 had eaten their fill. The number 12 in the Bible indicates completeness and fulfillment (we can think of the 12 tribes of Israel as meaning the whole of Israel, all of the people). Thus the Eucharist points us forward to what our future is meant to be – fullness, the completeness of the love of God and life in Him forever. On this solemnity of Corpus Christi, then, as we give thanks for the great gift Jesus makes of Himself to us in the Eucharist, let us think of that mosaic in the apse of San Clemente and pray that each day we may, through the Eucharist, be filled with Christ’s own divine life and always remain in Him as His branches, steeped in the waters of His love so that having been nourished by the Lord’s body and blood, we may become truly alive and one day be taken up into the fullness of the kingdom of our Father in heaven.